Summer is finally here! For many schools, this time of year is a chance for students and instructors to take a well-earned break, enjoy the good weather, and return refreshed and ready for the next term. However, for many engaging in social media marketing campaigns, the real work is only just beginning. In these days of increasingly limited organic reach on social platforms, summer can be especially challenging for schools. Faced with an online community that is less present and thus less likely to engage with their posts, institutions can find it difficult to maintain visibility during the warmer months and ensure they begin the next academic year in a strong position. Fortunately, with a little creativity, it can be possible to engage and even grow your social audience when school is out. Here’s how to do it. One of the challenges of maintaining your school’s presence on social media in the summer is that the current students and staff who would be actively engaging with your posts during the year are on vacation. With less of a reason to seek out news and updates from campus on a daily basis, they are less likely to pay attention to your institution in their news feeds. One simple but very effective solution to this is to actively seek out updates from your online community about how they are spending their time off. Encourage students and faculty to share photos and videos from their vacations using your school’s hashtags. Example: Bishops University featured this image of a student on vacation in Peru on their Instagram feed, and encouraged other members of their online community to share their summer adventures. You can suggest they wear your merchandise or school colours in the photos, or even run contests for the best pictures. If this tactic is successful, you might even be able to create full albums of the best submissions from all over the globe on platforms like Instagram and Pinterest. Example: The University of Michigan’s Wolverines Around the World Pin Board on Pinterest features an array of shots from students and faculty in diverse locations. 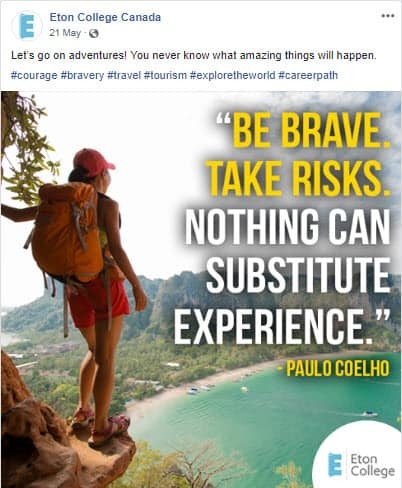 This approach will help maintain a sense of connection with your institution during the break, while also providing a wealth of interesting user-generated visual content from far-flung, exotic destinations. Many institutions use visual social media platforms like Instagram to showcase the natural and architectural beauty of their campuses and surrounding areas. And as the weather gets warmer, you may find that you have even more opportunities to capture picturesque images of your school. 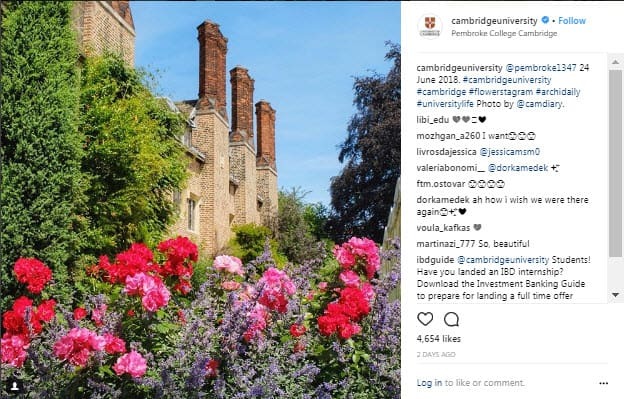 Example: This post from Cambridge University captures the summer flowers in full bloom on the college grounds. During the summer, your team can take the opportunity to explore your surroundings and look for visually striking images that highlight their beauty. Doing this while the campus is quieter can help you see it from a fresh perspective, especially if it usually teeming with people and activity. 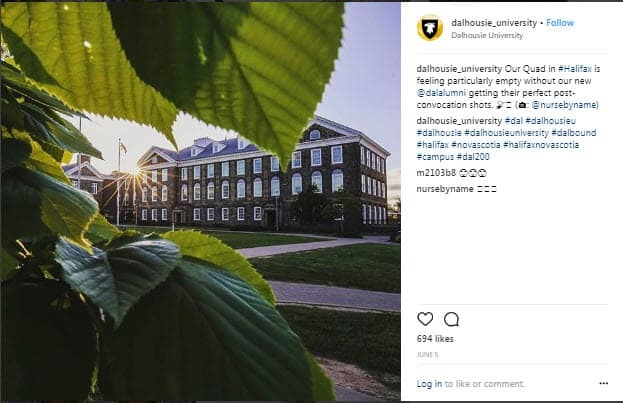 Example: This post from Dalhousie University makes use of its deserted campus to capture a striking image of the quad at dusk, while also including a clever shout-out to the school’s recent graduates. Showcasing your school like this during the summer will help remind your current students what a great place it is to study, and get prospective students excited about attending. Inspirational quotes are often a go-to tactic for social media in higher education. Famous, motivational words can help your school to articulate its message, reminding prospective and current students what you stand for and of the value of working towards an education and a better future. 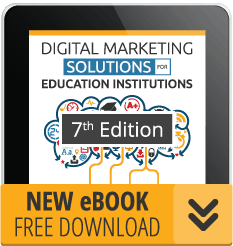 During the summer, these posts can be an especially useful way to keep your school top of mind among your online base. Your school could find interesting, relevant quotes that chime with your message and post one once a week, pairing them with interesting branded visuals to help encourage sharing and increase your visibility. Example: Tourism and hospitality specialists Eton College in British Columbia do a great job of finding famous quotes that chime with their programs. While many students will take the entire summer off, the same is not necessarily true for staff and faculty. From updating and improving their curriculums, to purchasing fresh supplies and equipment, to the vast amount of administrative work that may need to be completed before the start of term, summer can be a very busy time for many departments. 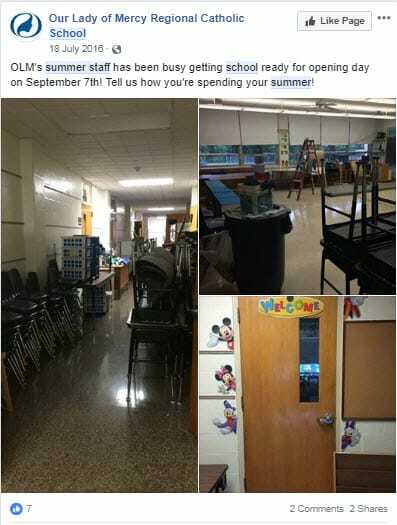 Example: This Facebook post from Our Lady of Mercy Regional Catholic School in Pennsylvania emphasizes the work being done by staff during the summer to prepare for the next term. Students may not often be aware of or appreciate just how much work goes into these processes, so why not use your social media accounts to tell them? Highlighting the tireless work of your faculty and support staff through photos and videos on social media will demonstrate their enthusiasm and dedication. In addition to keeping your social accounts active and visible, content like this sends a message that your school is one that really goes the extra mile to deliver a first-class educational experience. 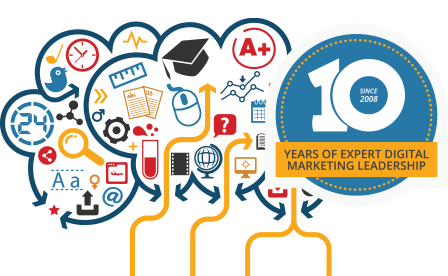 Another great way of using social media in higher education to keep your audience interested over the summer is to feature contests, polls, and games. A contest or a poll can be a fun and interesting way to raise awareness of specific programs and courses, and increase the reach of your posts. For maximum impact, it’s best to be as creative as possible. An original, unusual poll, for example, will capture the imagination of social audiences, and is more likely to gain attention and be shared by your followers among their peers. 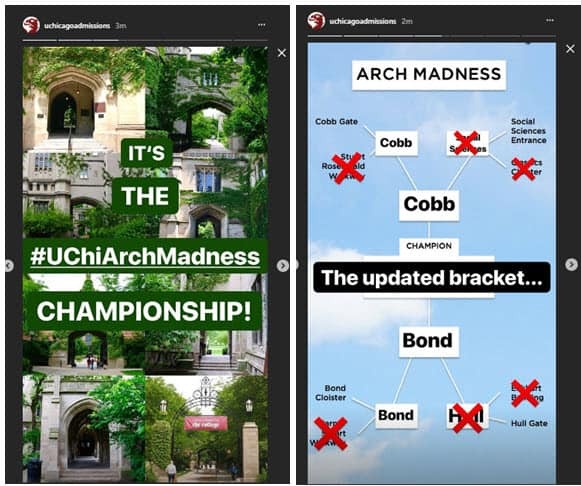 Example: The University of Chicago recently ran an “Arch Madness Championship” using Instagram Stories. 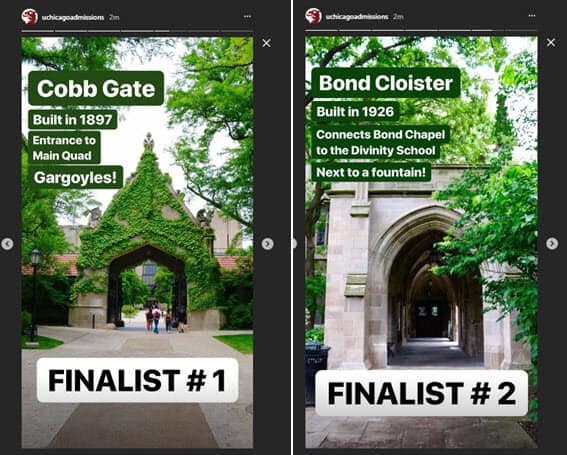 The novel poll involved asking students to vote for their favorite arches on the UChicago campus. The idea was a great way to capture the imagination of users online while also drawing attention to the school’s magnificent architecture. Likewise, simple games can be another way to encourage student participation. For instance, many schools also use the Stories features on sites like Facebook, Instagram, and Snapchat to create trivia quiz videos for students, featuring questions about their school, location, and programs. 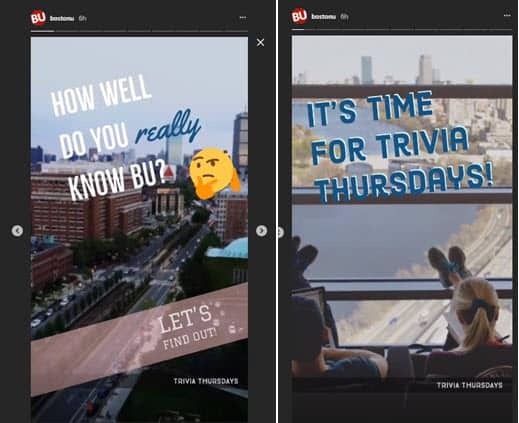 Example: Boston University create a regular “Trivia Thursdays’ Story on Instagram. The questions highlight some of the school’s unique selling points, and are overlaid on some striking visuals of the campus and city. Focusing on trending topics can be a good way to keep your school visible and involved in social conversations over the summer. Monitor newsworthy events, trending hashtags, and any other topic that is generating discussion on social media platforms, and create your own posts about them. 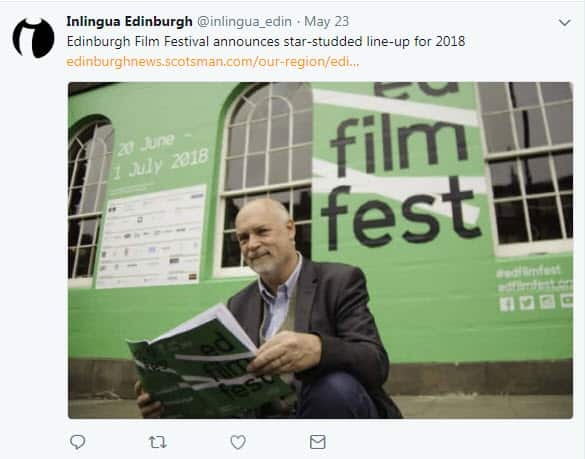 Example: Inlingua Edinburgh regularly posts content on Twitter linking to the latest news and events in their city. Of course, it is important not to simply piggyback on trending topics just for the sake of it. Ideally, the topics that you post about should have some relevance to programs or your school. This will stop your posts from seeming contrived, and also ensure that you are adding real value to online discussions. Example: The use of Video Assistant Referees (VARs) at the 2018 World Cup in Russia has generated much debate on social media. 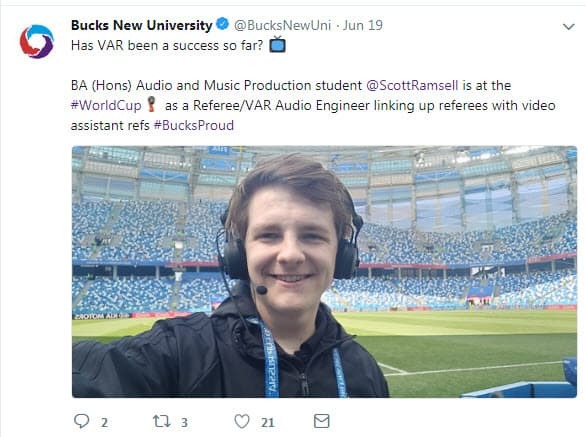 This extremely well-timed Instagram post from Buckinghamshire New University features one of the school’s students who is working as an engineer during the tournament. The post serves to both engage social media users about a topic of general interest, and to highlight the great opportunities available to the university’s students. Again, don’t be afraid to get creative when it comes to topical posts. For instance, this handy calendar from social media specialists Trackmaven offers a list of ‘National Days’ and weeks. Some of these are poignant, some are funny, and others are quite obscure – for example, this blog is being published on ‘National Sunglasses Day,’ and during ‘Water Melon Seed Spitting Week.’ Creating posts commemorating these occasions, many of which may be particularly relevant to your programs, could be a unique way to generate some buzz and get them trending online. 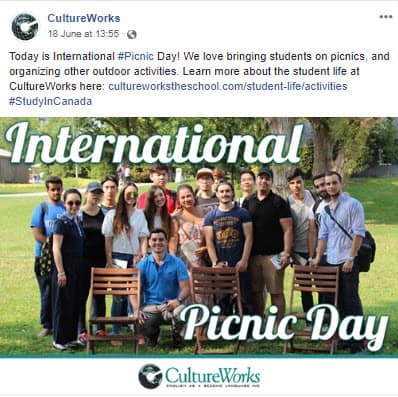 Example: CultureWorks, a Canadian ESL pathway program provider, created this post for International Picnic Day on Facebook. The post ties the event back to the school and the activities it offers for students. Finally, as the summer goes on, you can start to create posts that generate excitement and anticipation for the coming academic year. Try featuring videos, images, and Stories around your staff’s preparations, or any new facilities or programs students can look forward to over the coming year. 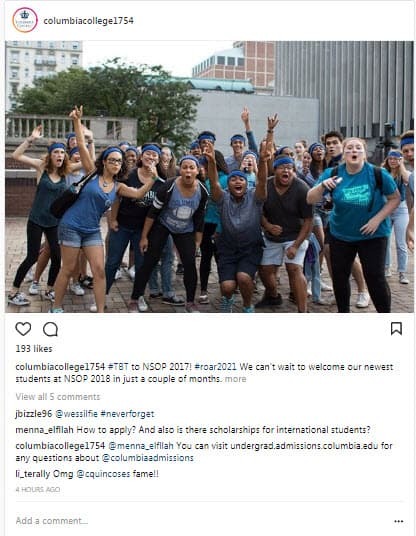 Example: This Instagram post from Columbia University gets the back to school hype started early, specifically targeting prospective students preparing to enter the school in the fall. “Back to school” posts will be of particular interest to your new students, who will be especially excited to begin this new chapter of their lives. Creating posts specifically targeted towards them will help welcome them into your school community and cultivate their participation and engagement with your social media presence from the very beginning. Of course, when considering social media ideas for higher ed, it’s important to remember that some are more suited to certain types of institution than others. How successful each of the above approaches will be for your school will largely depend on your audience and its preferences. By keeping your main target personas in mind, and thinking creatively about what would engage them, your school will have a great chance of keeping itself visible across social media all summer long.